Northern Irishman Alan Carmichael is the first driver to register for the 2019 British Rally Championship. The man from Ballymena is the first driver to signal his intent in 2019 and will drive an striking Hyundai i20 R5 on all rounds this season as he hopes to mix it with the BRC regulars. 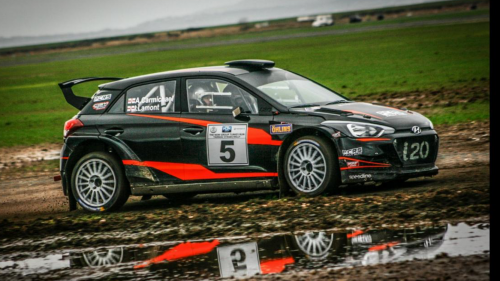 Let’s hear from a new face to Britain’s premier rallying series. Carmichael has driven an exotic array of World Rally Cars in his rallying career, but for the first time last season switched to the successful R5 format and has given his right-hand-drive i20 a thorough shakedown ahead of the new season. So, for a man with so much experience with big WRC and Group N machinery, how does he find the nimble little R5 Hyundai in comparison? New year, new challenge for Alan. What is he hoping for in 2019? The British Rally Championship will get underway on 16 February as the BRC descends upon Wales for the Visit Conwy Cambrian Rally. Competitors wishing to enter the 2019 series should act fast as entries for the opening round are filling up. Registrations for the series are also now open.